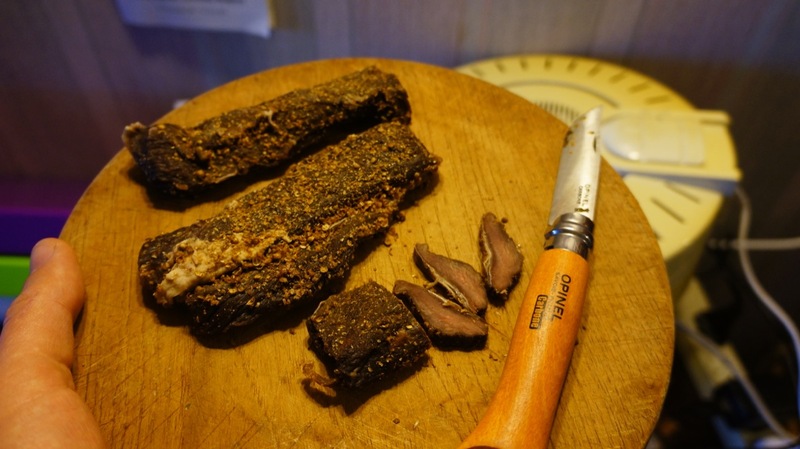 I had a go at making goat biltong from some back steaks. Came out very well. 1. Cover steaks in salt and leave for 1-2 hours. 2. Scrape off the salt. 3. Soak in apple cider vinegar for about 2 minutes. 4. Cover in freshly ground coriander seeds. 5. Dry overnight in food dryer, best when it's still a little pink in the middle. Will be taking this on the next trip along with the nuts and cheese snacks. P38, Smiddy, Dynastar27 and 1 others like this. Sounds bloody easy except I don't have a food dryer.